Designed for today's cooking, it performs well on induction ranges as well as conventional stove top. Oven and dishwasher safe. Every quality feature has been developed with your cooking enjoyment, convenience, health and nutrition in mind. A remarkable merging of metals combined with superior workmanship has produced an exceptional seven ply stainless-steel cookware. Using advanced metalworking techniques, multiple layers of aluminum and steel yield a cookware that is unequalled in efficiency and durability. 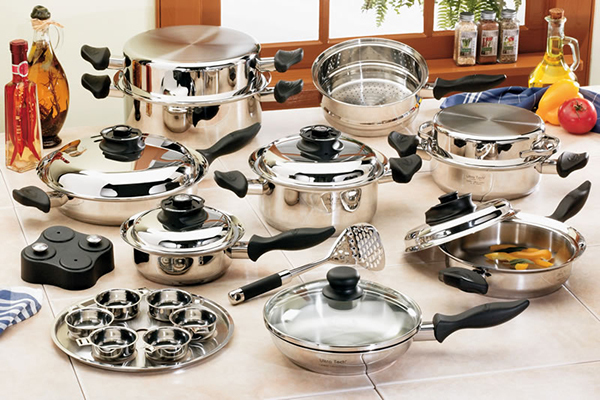 Now you can invest in a set of seven-ply cookware that will bring you a lifetime of cooking pleasure. Handles & Knobs (phenolic): Designed to fit your hand better and provide a safe, sure grip, the phenolic handles and knobs are durable, dishwasher safe, as well as ovenproof to 350°. Square shanks of welded stainless steel prevent handles from loosening and turning, while the wrap-around flame guard prevents the possibility of flame damage. Moisture Seal: The moisture seal is designed to cook vegetables with little or no water added to enhance both the flavor and appearance of your favorite vegetable. A more efficient use of energy cooks food evenly from all sides with less heat. Self-Storing Covers: Takes the clutter out of the kitchen! Covers are uniquely designed to nest inside pans and conveniently stack. Saves space and time. Scrub and cut fruits or vegetables. Place in the pan and rinse with water, then cover the pan with the vac-control valve open. Place the covered pan over medium high heat. Allow the vapor to escape through the vac-control valve for 3 to 5 minutes. Close the valve and turn off the heat. DO NOT remove the cover. Let stand for 5 to 20 minutes, depending on the recipe, and serve.